What Are The Things You Deed To Look For Before Buying? What Are The Perks Of Using Oil? How To Maximize The Effect? How is this possible? Has the universe conspired to make her flawless while everyone else has to endure those pesky postpartum scars? Yes, I’ve been there, and I know how it feels like to lose your confidence one bit at a time. For the record, stretch marks can appear ANYWHERE (from belly to thigh and calfs – bye-bye shorts and bikini). So how did I deal with it? No, I did not rely on home remedies alone. 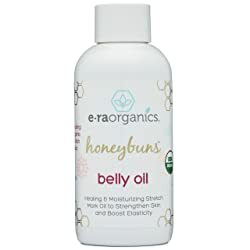 I sought help from the best oil for stretch marks. It’s simple. After many trials and errors, I realized DIY remedies are not for me. They just didn’t work, period. Besides, most of the mixtures are meant to be used BEFORE you even get those purplish lines. There are some of us who don’t anticipate the appearance of stretch marks because it’s often the least of our concerns when we’re pregnant. Most texts would say that stretch marks will no longer be that noticeable in six to twelve months. But my personal experience has proven that it depends on which angle you’re looking. And there’s no need to buy every single oil product you see on the market; you just have to choose wisely. You have to compare each one to determine which will suit you best and meet your needs. Remember, you are after the effectiveness, and the big price tag does not necessarily mean the BEST. First and foremost, you need something that will deliver fast results. Come on, isn’t that what everyone wants – instant effect? Second, you’d want something that will address the source of the problem directly. Think about the time you were pregnant, how much weight did you gain? Back then, your body started growing so fast it was getting difficult for your skin to keep up which is why the elastic fibers located under your skin broke and well, ended up in stretch marks. So, you’d want something that will stimulate the production of collagen and elastin which will help improve your skin’s elasticity and also smoothen out the scars. Finally, you want something to lessen your skin’s discoloration. Here’s the truth: moms swear by it. If that’s not enough, I don’t know what is. But on a more serious note, oil is better than say, cream because they have a higher concentration of the ingredients. Also, oils have a natural soothing effect on the body, and they also tend to have a better effect on your skin tone and elasticity, and that is hitting two birds with one stone. You shouldn’t just dab the oil on the body area – you need to massage it. It will help for better absorption thus allowing the oil to penetrate the skin faster. Besides, a little massage to the skin has other benefits as well: it increases blood and oxygen circulation and helps in reducing muscle pain. By now, you’re probably like, “Well what do you recommend?” That depends on various factors. Like in most cases, it’s not a one-size-fits-all. The oil products which can address your preferences and personal needs may be different from others. 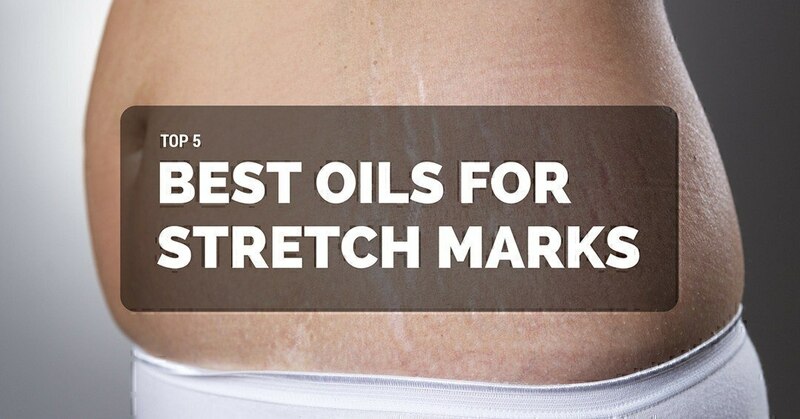 But don’t worry, I’ve rounded up some of the best oil products in the market which might help with your stretch mark problems. A blend of pure plant extracts, it contains Vitamin E (which is an antioxidant and helps protect your skin from further damage) and lavender oil (which helps restore your complexion, thus lighten any discoloration and has aromatherapeutic properties). ​It keeps your skin moisturized and nourished which will prevent further breaking of the elastic fibers. ​For those with sensitive skin, Belli has been tested for any allergens and was created without the use of paraben preservatives, gluten, phthalates, artificial dyes or fragrances. This oil is even safe for both pregnant women and nursing moms – rest assured, there are no ingredients which might cause detrimental effects to the baby. ​Keep in mind, however, that even with plenty of safety screening procedures and other precautions behind the creation of this product some might still experience an adverse reaction. The best way to test it would be to use a small amount on one part of the body and observe its effect on you. ​It has a nice, relaxing smell and can even help prevent itching. 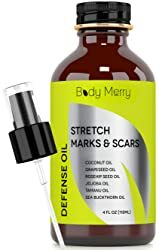 Using USDA Certified Organic Ingredients, this stretch mark product offers several benefits to your skin: it will moisturize to avoid dryness, it will nourish to help increase collagen and elastin production, and it will repair any damage to your skin. ​The sudden growth of your body will cause stretch marks, and that is why this oil might also help your skin expand thus preventing the breakage of elastic fibers in the process. Of course, that would be best even before stretch marks have formed. ​It’s rich in vitamins like B, C, D, E and K in addition to Omega 3 and Omega 6 fatty acids; it could further help nourish your skin and keep it healthy. ​To keep your skin supple, this could boost the elasticity and in turn, reduce the formation of purplish lines along your belly, legs, arms or any part of your body. ​The natural oils also feature deep hydration which helps avoid skin drying. ​It feels light on the skin but may be a bit pricey for some. It keeps your skin hydrated thus improving its elasticity which in turn, helps lessen the appearance of scars and stretch marks. There’s also a 90-day manufacture guarantee which could be important to you if you’re still having doubts. Because of the blend of the six oils and all the benefits they have to offer, this product also has effects on wrinkles and fine lines. Now that’s definitely a big plus! It could be a bit greasy for some but hey, it’s oil so that’s something you should expect. This has vitamins and essential oils which can help even your old scars. From stretch marks to dark spots and even hyperpigmentation, it can work wonders on the elasticity of your skin and also in improving its complexion. Because it’s hypoallergenic, there’s minimal chance of experiencing adverse reactions like itching and burning sensation on skin although you still have to look out for even the slightest sign. It may be cheaper than others but there’s a lot of content in this product. It’s quite a steal considering the quantity you get for a small price. You might see results and improvements in as fast as two weeks. Of course, they are still visible but they can lighten in just a few days.You might notice that there’s no medicated smell which is always a good thing. And even though you scars will lighten, you will not experience any peeling. It contains antioxidants and fatty acids which will hydrate your skin and boost the collagen production to avoid the development of stretch marks and other scars. It also has vitamins A and E and linolenic acids which will lighten the scar and keep your skin healthy. They offer a refund which means they care about the client’s satisfaction and of course, their product’s quality.It may not have a pleasant smell but it does work really well as moisturizer. It’s surprisingly big especially for its price and that’s not something I’d complain about. Although it isn’t very greasy, you may have troubles dropper and it can get really messy quickly. It might stain your skin a bit with orange color at first but it will eventually go away when the oil has been fully absorbed by the skin.It’s versatile and can even be used for cracked heels. 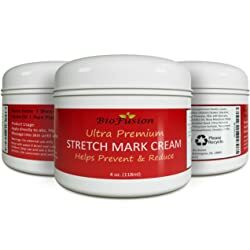 I would personally go for BioFusion Ultra Premium Stretch Mark Cream because of two things: first, it can be effective even for your old scars and second, the result is fast. You see, there’s nothing more frustrating than scars you can no longer treat. And while most of these products are great at preventing stretch marks, I find the BioFusion as the only one that can help lighten the complexion of old scars (think stretch marks from previous pregnancies). Also, if there’s anything that can give me even a bit of a guarantee that I’d see improvements in my belly scars in two weeks; I’d definitely go for it. But keep in mind that while some may find the scent, texture and color of the oil as a deal-breaker; those aren’t your priority. You would want a product that treats your stretch marks, lighten the scar and improve the overall health of your skin.